Madrid’s locals are nicknamed gatos (cats). This is because Madrid locals are known to go out until very late, and frequently. Nightlife in Madrid is one of the greatest aspects of this city’s culture. If you like going out you will find parties every night of the week. It is true that in the past it used to be wilder & freer, so now it can be more challenging to know where to go at any given time. We are here to help! Madrid’s nightlife is epic and you have many choice. Bars tend to close nowadays at 3 in the morning, so what do you do after that? I personally like to go to places where there is great music, and especially where people dance. Otherwise, I won’t make it until 6 in the morning. Many places do have music, but not many have an audience that genuinely dances. 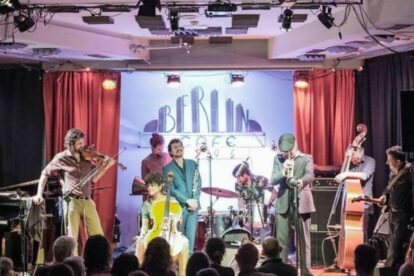 Cafe Berlin has found a formula where their shows and DJs have attracted a certain audience. People of any kind of age and a slightly alternative taste can be found here. If you go, check before which kind of party or show you can expect, as it can change drastically. For me this spot has a special aura that makes everybody dance. The atmosphere of Cafe Berlin is a mixture of cinema and theater with the tint of a bar of the ’20s era. Get up and dance!